- Tangled Threads -: Do what makes you happy! 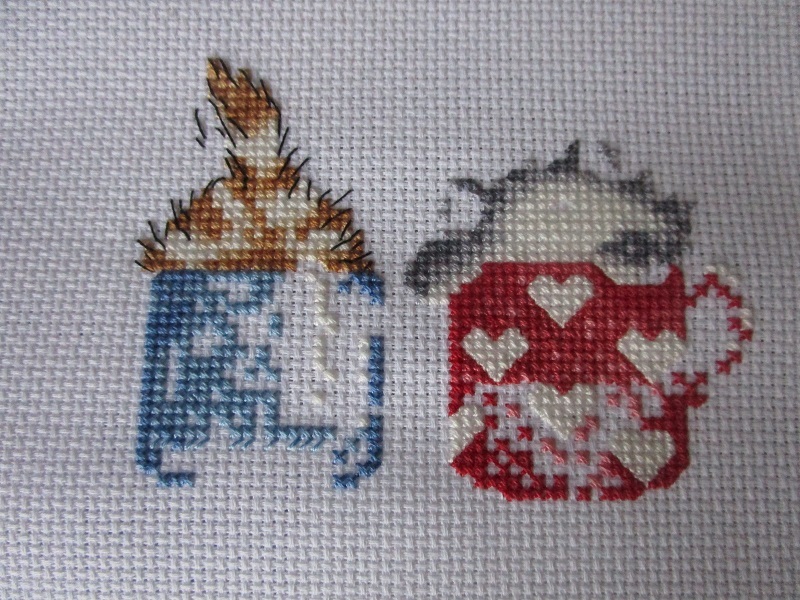 I changed the colours a bit as it's charted using Anchor threads and I don't have a complete set of anchor threads. I converted the colours to DMC and still changed them to what I liked better.....I'm a bit weird like that :) I used a softer shade of red, mine is more a pinky red rather than the very bright red that the chart called for. It's stitching up quite quickly.....and I'm enjoying it, which is what it's all about! 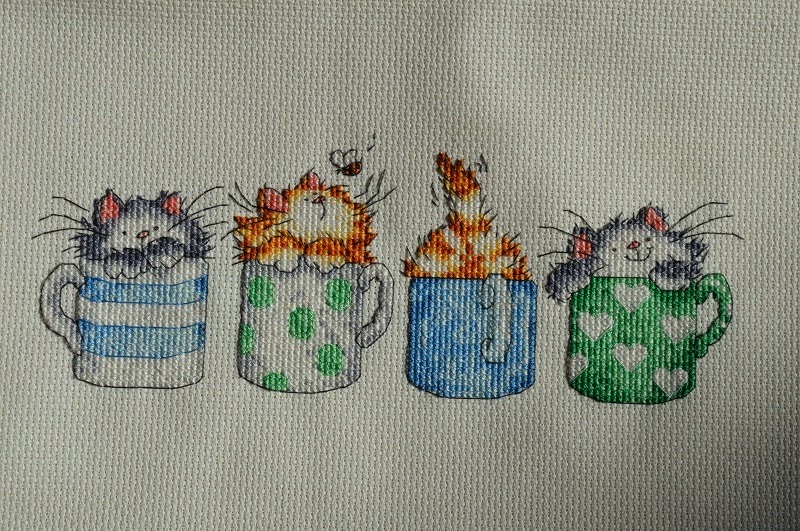 Some of you may remember that I have previously stitched this design.....and changed the colours then too! 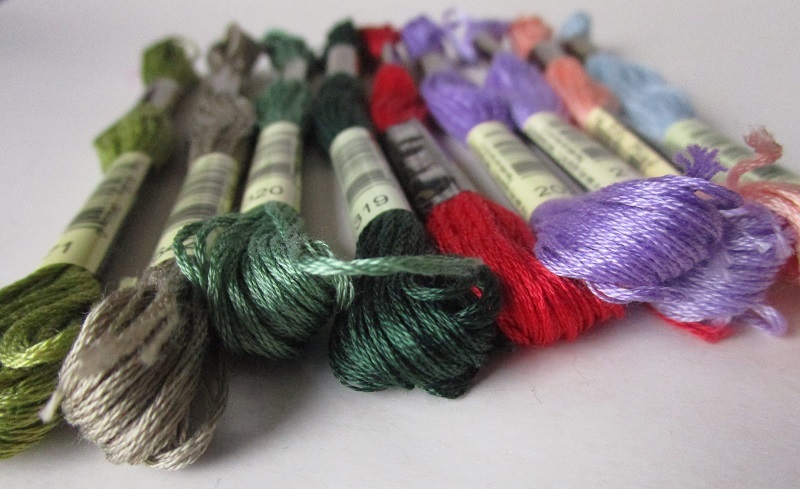 This is the colour scheme I went with then.....and I so wish that I had written down the thread numbers that I had used, it would have made life so much easier this time! I really should invest in a stitching diary, or something of that ilk.....does anyone record their stitching in a diary or notebook? What sort of info do you record....is it the number of hours you work on each design, or thread info etc....please let me know as I'm quite curious. Now I'm back to being a happy stitcher once again! Glad you decided to work on something that makes you happy. That's a great philosophy in life with very few exceptions. And you're still stitching on a kitty design. It's a darling pattern. I love the colors you're using. 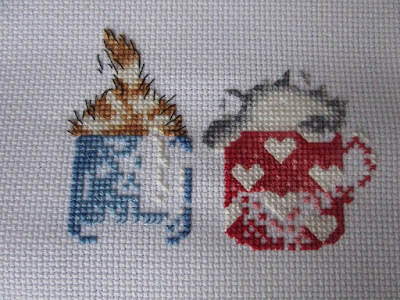 Best thing to do: stitch on what makes you happy! 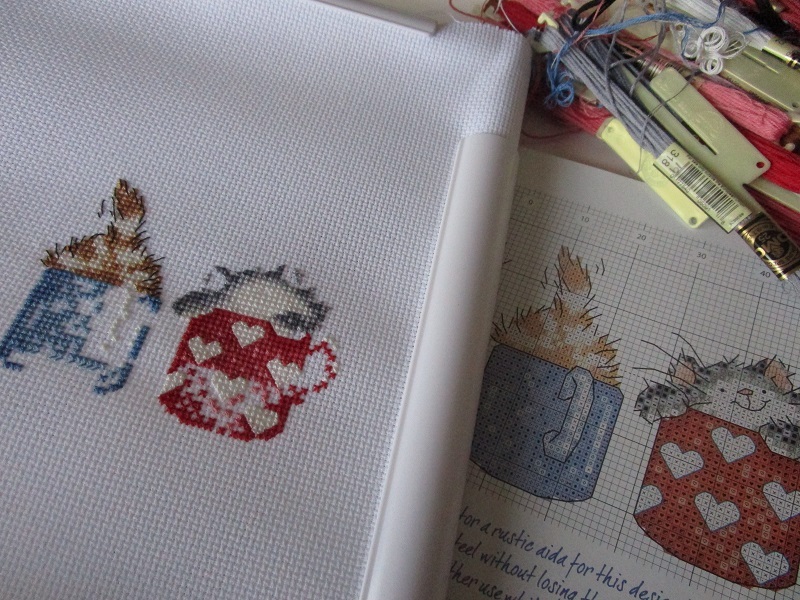 Glad to hear you are stitching a design that you enjoy. It is a very sweet piece. I use a notebook to write down any major changes to a design. I have tried to keep track of hours before but have not been that successful. They are looking cute:) I agree with do what makes you happy. I don't record anything other than pics on my blog. I often change colors mostly based on what I have in stock. If I happen to change colors due to few color code mismatches in the Anchor threads that we get here then I note down on the chart itself. Yeah it's hard to work on a project when you hate it. Just catching up on the kitty chart story....you are so right...stitching is meant for pleasure and if it isn't being enjoyable change to another project!! That's what I'd do too! Your new one is very sweet. 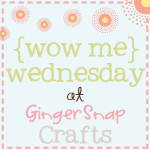 Happy week Rhona, and happy stitching. Love this design. Margaret Sherry's cats are the best. I have a diary and I write down which was my main project for each day. Any minor changes I will note on my blog when I post about the project. Same with fabric choices. If I do a conversion I will make a note on a piece of paper and leave it with the chart. Great little Margaret Sherry cats. 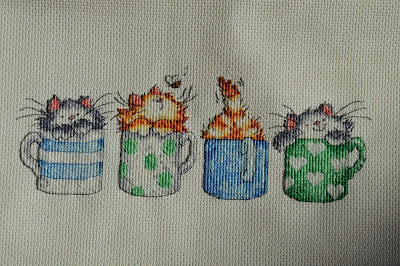 Great decision - those cats in mugs are so sweet and based on your progress it looks as if you're enjoying stitching them too! Late....but with a good excuse!